If there is one thing General Dwight Eisenhower learned during his military career it was this simple fact: the only person responsible for getting the job done, no matter what that job may be, is you! 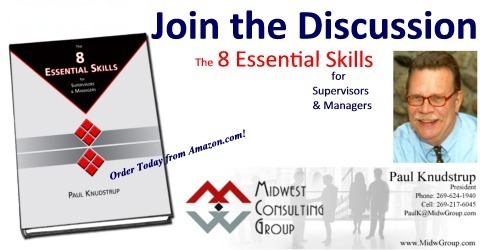 That’s why “Managing Yourself” is Skill 1 in The 8 Essential Skills for Supervisors & Managers. If you can’t manage yourself – your workload, your projects, your tasks . . . then how can you be successful at managing others? Important & Not Urgent – Thing you must decide about – who & when? Eisenhower used this matrix every day, listing the issues he had in front of him on this form. Then he used this approach to help him manage himself every day, whether he was General Eisenhower or President Eisenhower. Give this simple yet powerful tool a test drive for a couple of weeks. Where would you place all the projects and tasks on our plate right now? What are you committed to accomplish in the next week? What could you delegate to someone else on your team who is read for a new challenge? What could just be dumped in the circular file as not worth the effort? After all, it’s up to you to determine what you will do today, tomorrow, and beyond. We seem to have this notion that becoming a supervisor or stepping into a middle management position is an irrevocable shift from being “one of us” to becoming “one of them.” Certainly our formal organizations – corporations, universities, government agencies seem to work that way. Many nonprofits too, for that matter; especially the large ones. Supervising and managing is, frankly, not for everybody. And yet our organizations are set up in a way that basically says, “If you want to make more money and have a more secure future for your family, you need to become a manager.” I guess that may make sense to those that run larger organizations; certainly it was the path I chose for much of my career, since I worked in large organizations. Suppose you’ve stuck your toe in the “supervision pond” and maybe even jumped in with both feet. There’s lots to like about management, but perhaps you miss the thing that brought you to the organization in the first place. Maybe that was direct contact with customers or clientele. Maybe it was the hands-on “making” of something; you, creating something of value. So where is it written that when you become a manager you no longer can do the things that attracted you in the first place? I think it makes great sense for every supervisor, every manager, to stay in touch with their roots. Keep a hand in the game, an oar in the water to make sure you are connected to the folks that make it happen out there every day; the people making the products, delivering the services. In the University world, presidents often make sure they continue to teach a class or two in their field, CEO’s take time to get out of the executive suite and see what’s going on in the trenches. Managers make sure they keep connected to their core interest by spending time with their sleeves rolled up. Makes sense to me. What do you think? Do You Really Want to be a Supervisor? Being a supervisor . . . managing others . . . leading a program staff or production team where you work is often rewarding and energizing. It provides an outlet for your creative passion, and can be a very real way to contribute to your organization and your local community. And of course it can also be difficult, challenging,, disappointing, and a major pain in the neck (or some other portion of your anatomy). Many times we think becoming a supervisor is more or less expected; the next step on our career. Moving from an individual contributor or team member role to managing a group is often viewed as a right of passage in the organization. That’s great if being a manager is what you really want. But there are so many other ways to make a positive and substantial contribution to your organization. Taking on a new project, developing a new product or process, taking the new team member under your wing and teaching them how to get things accomplished, looking for ways to exercise your sphere of influence (see: “It’s All About Choices“) to help your team and the organization move forward . . . all examples of “leading” without becoming a supervisor or manager in a more formal sense. So when the opportunity appears to move into a management role, take the time to ask yourself if you really want to be a supervisor or if there are other ways you can contribute in your current role. Get a good handle on the expectations for supervisors in your organization. Managing a team or a unit isn’t for everyone; make sure it is for you before you step into that role. We are all a work in progress, don’t you think? One way or another we are in the process of becoming the person we will be tomorrow, next week, next month, next year. Too many times the process of becoming that person is left to random chance as we react to what is happening to us and around us. Are you becoming the person you really want to be? If not, what does the person you really want to become actually look like? Self-knowledge builds self-awareness. Self-awareness helps us to understand our individual strengths, weaknesses, talents, and preferences. And that understanding can help us take a long view of our life. What we do today – the decisions we make, the choices we take, the forks in the road that will appear this week without us realizing that they are forks and choices – all of it will influence the “me” who we become tomorrow, next week, next year. We all have choices every day. Choose wisely. What will your choices be today? Who are you in the process of becoming? Food for thought. We see changing roles, expectations and challenges for supervisors, managers, and professionals all around us. Responsibilities and assignments change frequently, priorites are moving targets, and everyone is required to grow and adapt all the time. The increased pace and changing demands requires an adaptive and flexible approach at all organizational levels, and that means life-long, continuous learning. Knowing what is needed for the future is only possible through knowing where you are right now. That’s where 360-degree assessments like the Management-Leadership Practices Inventory come in. They provide a baseline of valid, reliable feedback to serve as the foundation for an individual, team, or organization development plan. Click here for more information on the assessment tools we use; we know they work. In addition to the ONEplace Nonprofit Leadership Academy, we are currently completing a 360-degree management and leadership assessment process for two large teams. In both cases the organizations recognized that the need to invest in professional development was long overdue. Helping our clients to adapt and change – and being part of the individual and team growth that results – is exciting, rewarding and just plain cool! What is your organization doing to develop the skills, attitudes, and behaviors needed today and tomorrow? What is a “colleague”? In the broadest sense it’s a term we use for someone we work with and value. Still, it has come to mean much more than that to me. When I think of my own colleagues, I see people with whom I work, sure. But more importantly, I see friends. Individuals with their own interests, yet we share interests in some areas. Over the years we become more than people who “work together” – we become friends. We look for ways to collaborate (another lovely word) with each other, to support and encourage each other, to be there when things don’t go quite the way we had hoped or intended. And occasionally to provide that poke, prod, nudge in the direction of our true purpose when we get a little off-track. I am blessed with superb colleagues and friends within the virtual organization we call Midwest Consulting Group, Inc. And over the years I’ve also developed a wonderful network of colleagues across the country. The times we spend together are among the best of times. To all my colleagues and friends, I wish the very best for all of us in 2012. And Thank You for being part of my life. How about your colleagues? When was the last time you thanked them for being among that special group we call . . . colleagues. This summer has provided several opportunities to leave work behind for several days at a time. Some time to myself to relax and reflect. Some time with colleagues thinking, planning, and collaborating together. The experience reinforced for me the wisdom of stepping backward to go forward. The opportunity to gain some perspective on the past year, look ahead to the next 12-18 months, and give some thought to the longer term future helped me to celebrate accomplishments, clarify values and priorities, set goals, and do some planning for myself and our business. It was a great experience. How many of us set aside time to really step back to gain perspective on a regular basis? We all know the value of reflection and but it is often hard to “get away” from the daily rush and workload. We suggest an annual multi-day retreat such as I did a few weeks ago; it works wonders. But . . . you have to get it on your schedule and then actually do it! When will you invest in yourself, your relationships, your business, and your future? Is it time for you to Retreat to the Front?